Since Torchic is more than likely going to be May’s Community day, what do you guys think the bonuses will be? Hopefully 3x Stardust, but I’m particularly excited about this one because I have a hundo Combusken ready to evolve once the event starts. While Blaze Kick is in the game master file, I still think it will be Blast Burn. 499 Torchic Candy too - Can’t wait! The 98% Combusken has 14/15/15 IV in the same order as the Appraisal does (so HP-Attack-Defense). 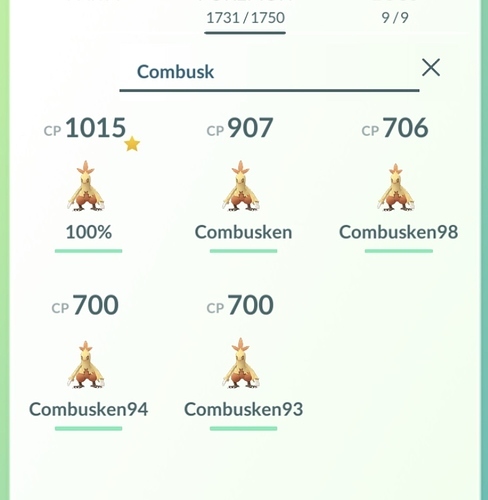 How come that second Combusken doesn’t have a percentage rating? Has less than 80% IV, so I didn’t bother to check what its IV actually is. According to the Appraisal it is somewhere around 70-75%. Ah, that makes perfect sense. I’m surprised you even kept it since you have four stronger ones. I’ll look if one of my friends want it when we become Lucky Friends. Otherwise I’ll transfer it. I agree that it will be Blast Burn. I feel like they will save Blaze Kick for something else. … here’s also hoping for 3x Stardust too! Lucky me, there was a small shake up at work so im in another shift by then, wich happens to be free that day. That shift was the 1 out of 5 i didnt want to go to but lets focus on the bright side for now. I hope i can get some good trades done or capture/hatch some good ones before that time. Got 2 100% Blaziken wich i evolved not really thinking about CD, so they both have fighting moves. Kinda bummed about that, hopefully RNGeezus will smile upon me before the 19th. Speaking of blaziken, I have one in the great league, and Combusken can be decent in the Kingdom Cup, with Ember and Flame Charge/Rock Slide. CP doesn’t mean much if IVs are awful. You just defeated your own argument with that last statement. CP means nothing as soon as leveling up is part of the equation, which is actually is. He’s already decided to either transfer it or hold onto it for a Lucky Friend trade. The CP means nothing to him as a result. It’s the IVs that matter. CPs merely are the result of what IVs calculate based on current level. With the last 3 CD’s being disappointing with amount of Shiny’s and IV’s worthy of keeping I’m considering getting on the Push Bike and let the Go Plus do the work. Nothing about Torchic and it’s evolution line excites me. It’s just a Candy and Dust collection day as far as I’m concerned. I have almost 3000 Torchic candy, so the exclusive move and possible dust bonus are more of a concern for me. I didn’t plan to max out the 907 CP since it’s IV’s aren’t interesting enough. Yes, it takes less Stardust to max out than the lower ones, but the lower ones all got better IV’s. 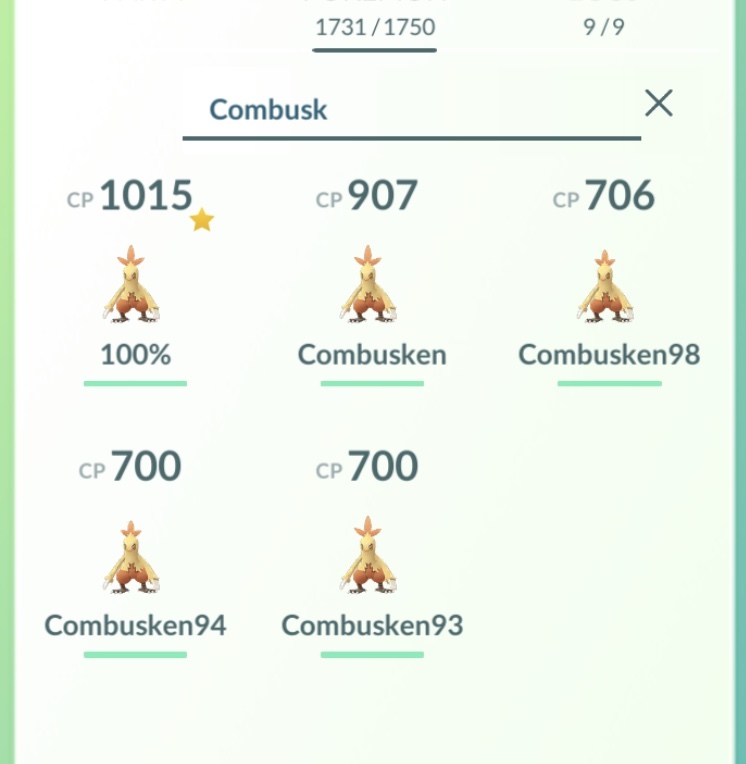 However, if I’m going to max out one of these Combusken in it’s evolved forme, besides the 100% that I’ll evolve during the next Community Day if it turns out it’ll feature Torchic (which it will probably do), it’ll be the 98% since it’ll clearly be stronger than all the others, besides of course the 100%. Biggest hope here is a good dust bonus.